SUV39H1 is a human homologue of the dominant Drosophila PEV modifier Su(var)3-9and is composed of 412 amino acid residues. SUV39H1, as a histone methyltransferase, selectively methylates histone H3 on lysine 9, which generates a binding site for HP1proteins. HP1 proteins are a family of heterochromatic adaptor molecules involved in bothgene silencing and supra-nucleosomal chromatin structure. SUV39H1 plays in importantrole in histone modification and regulation of gene expression. 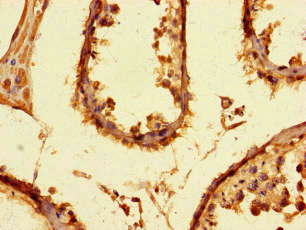 SUV39H1 Monoclonal Antibody. Unconjugated. Raised in: Mouse. Yu T et. al. (May 2017). Metformin inhibits SUV39H1-mediated migration of prostate cancer cells. Oncogenesis. 6(5):e324.